Gettin' Punky With It: Punky Sprouts Albums & a giveaway! Hip, funky, fun, new. Looking for a new media to strike your creative spirit? 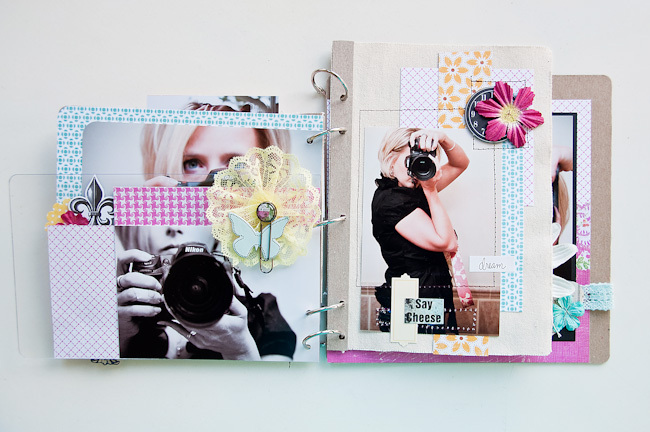 How about mixing it up with mixed media albums. Punky Sprouts marked their debut on the scrapbooking scene this year at CHA with a fabulous line of eco-friendly albums full of texture and possibility. Back when I started scrapbooking (in the days before current high schoolers were born), scrapbooking meant die cuts, patterned paper, cardstock and pictures. That's it. But just as I've packed on a few years and a couple of kids, the industry has collected a whole load of new textures and media that are now a regular part of the scrapper's world. Isn't life beautiful?! I wasn't really planning on it, but I'm going to let you in on a little confession. I've been in something of a scrap-funk lately. The mojo has been away for awhile, and I have been left a little creatively lonely without it. Enter: Punky Sprouts. When the albums arrived in the mail, with a sweet little note, I might add, I was hoping I would be able to squeeze enough motivation out to make something that would do these cute albums justice. What I ended with was something much more... inspiration. The inspiration that I had been lacking. All of the textural layered variety loaded into these albums is truly a creativity explosion waiting to happen. I drug out my glue gun and sewing machine, then used just the paper, ribbon and pictures I hadn't cleaned up from my previous scrappy project. That was the end of it, or really, the beginning of it. The paper scraps started flying! This little album was the spark that I'd needed to rekindle my scrapping fire. The texture and variety of the album pages. The very cool canvas pages. I'd love to see a list of adhesive types that work well on each surface. Even more fabulous media types, and album designs. Tell us what you think about these new albums that are mixing up the surface options for your projects! Leave a comment by noon EST on Thursday to be entered to win the Punky Love album seen below complete with Pink Paislee papers and embellishments! That looks like a really cool concept, out of the box! Combined with pink paislee papers, my creative mojo will be hummin! Love the idea of mixing it up--and combining different surfaces/textures is like getting the best of all creative worlds in one, meaning more for your money (and who doesn't like that?!). I would love to put my hands on this album so I could feel the texture for myself! Looks fresh and fun! Thanks for the great review and the inspiration! These albums look like fun. I like that they seem to be a mish-mash of different textures and sizes. It will make for something different. This is a cool concept. I love the different pages and how you can get a sneak peek at the pages to follow. I've always tried to mix up my albums but can never make those albums look just right...I would love the chance to try one of these! thanks! I love altering minialbums, but I've never tried these before. I think these albums look funky, so their name is very fitting Punky! Looks pretty cool... love the mixed media. I have never heard of this company... thanks for the introduction! Love what you did with the album. I would love to win one to try it out myself!!!!! Thanks for the opportunity! Just wow. I love everything about this album! Did I say "wow"? Definitely outside my comfort zone! I'd love to give it a try. I love, love, love that album. Mixing is so neat!! 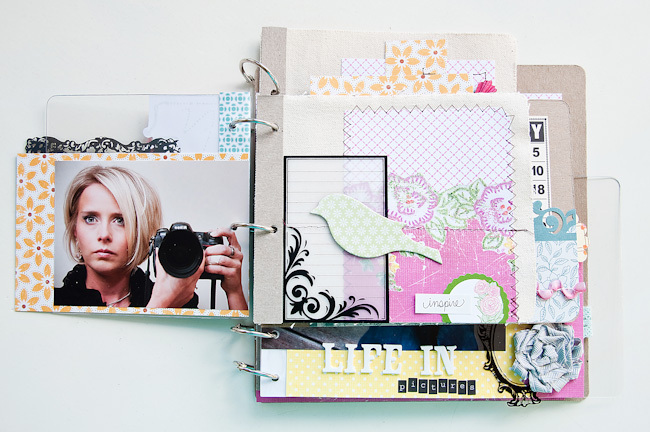 Scrapbooking just gets more fun all the time, especially with this kit from Punky Sprouts. Would love to try it out! This line definitely would be out of the box for me. Would be fun to try something different. Having three sons and one grandson everything seems to be same after the while. I have a new three week old granddaughter so would be challenging for me creativity wise to do this. Fun but difficult. Keeps me young. I had never heard of Punky Sprouts but that album looks fab! I love mixing textures anyhow and have been curious about canvas for a while now. LOVE your album Noel!! Great job! So glad this inspired you...we all need that once in awhile when we are in funk. Thanks for the chance at a giveaway! These albums look amazing!! This looks like a way fun album! I have not seen these prior to reading your review and I am loving it! Noel, you did an awesome job with it! love those mis-matched layers, funky textures, acrylic pages, the felt, this book just looks like fun to play with! How fun! I'm addicted to mini's at the moment and these are just too cool! The album is fabulous. I have too started purchasing different mediums to add to my albums. Felt, ribbon, fabric, burlap. Love it. The ideas are just pouring out. I actually made myself a little notebook to jot them all down since with a newborn time is sometimes limited. Thanks so much for the chance to win. I haven't done an album yet with different mediums but I've been looking at all the cool things people have been doing with canvas and other textures. I'd love to try this. Wow...what a cool album....I love minis and this one is so cute! Oh wow--love these! I wish I had an ounce of this creativity! I would love to play with these! omg, this is so awesome. i've been itching to scrap and create something out of my (square) box shape. ur album came out so cute and the giveaway looks great too. Love the mixed up look of the album! This would be a "stepping out of the box" for me but I would love to give it a try! It would make a great gift for a mother's day! i love the look of mixed sizes and textures, but have yet to try an album like this. it looks like fun! Love this! For me to immediately think of different ways to use something is rare indeed! This could be really cute for the granddaughter, punk it up. Little kids would like one too. My daughter is into vintage, shabby chic! I see too many fun things in my future! Gasp! I love it! You could really do some fun things with this concept! awesome and super fun are the words that come to mind. great project, glad to hear your mojo has returned! I love the idea of mixing it up and would never actually do it on my own. Would love the chance to try! Wow I have never seen Punky Sprouts before! Looks awesome! I love the mixture of textures...too cool! I think these look really cool! I've been moving outside of my comfort zone and giving myself permission to do things a bit differently. These albums look perfect for that mindset! This looks really fun! I hear about that scrappy mojo- that just happened to me! Oooh pink paislee! Love ite! Love this album! You made a great album!! Okay, that is the cutest thing I have seen in a very long time!!! Its fantastic!!! And just the think to get anyone out of their scrappin funk! I love the different textures, mediums and overall coolness! I would love one of these sweet babies! I just love, love, love everything about this! Thanks for the review, the super cute album, and the chance to get my hands on one of these! Wow, those are way cool!! I love the textures and your project is awesome!! And to win some Pink Paislee along with one of their albums?!! That would dfinitely be heaven!! I love the combination of textures and materials...I would love one of these! i'm in a bad way FUNK... i would LOVE to win a mini book and some NEW fun papers! I lOVE the 'mixed media'... it's the fun way to do things... along with it being GREEN. LOVE that. thanks for your inspiration! These look so fun! What a great giveaway. Thanks for a chance to win! I love the different sizes of the pages and the textures. It looks like so much fun! And....some Pink Paisley to go with it....awesome! AAAAAAAAAAAAHHHH!!! I love it! I love the mixed media and just ALL OF IT! Soo awesome. I feel so inspired and am so thankful for it! I've been feeling a little creatively lonely too lately. I feel so energized! Love that album! Sooo cute! Wow! Love it!! What a great giveaway! I am just starting to get into the mode of making mini albums and think they make great gifts for friends. I would LOVE to give this one a try. Thanks for a chance!! I love, love love albums. This is great! You created such an amazing book and I love the thought of having al lthe different textures in one book! Awesome and thanks for the chance! I really like this album... i am definitely adding it to my wish list. I really like how you did yours also - thanks for the inspiration! I love the idea of mixing it up! I LOVE how your album turned out. I having things mixed up a bit. Great idea. The project albums was great. God bless! I think the albums are thought-provoking. Before you laugh, I am a traditional 12X12 girl, with a few dashes of square/rectangular mini books thrown in there. The variety of page sizes, textures, materials is kind of scary but definitely intriguing. I would use one to really make myself stretch out of my comfort zone. That looks so fun! Your project looks great. I should like to feel these textures and try it myself. Your album looks great! It is definitely different. And sometimes different is good. It get's us out of our comfort zone. I think I like the album being different. Thanks for sharing. really cool mixed media album! and the way you dressed up yours is incredible, love your photos and colors. This looks like it is right up my alley! I had never heard of this company before. I would love to try an album like that! Pretty cool - made me kind of think about Punky Brewster which I watched when I was growing up! Your album is so cute. 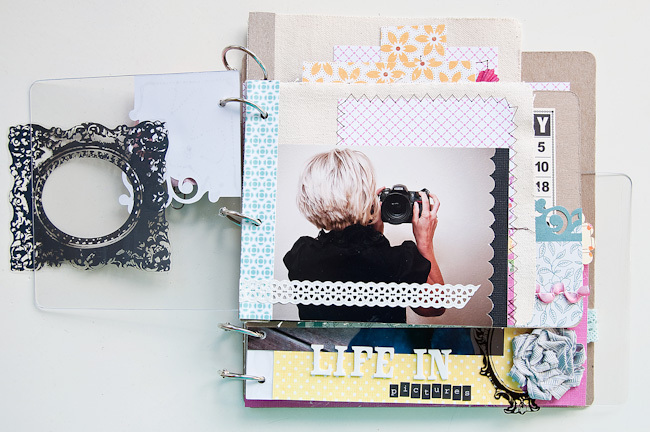 Lots of scrapbook inspiration. I am into minibooks right now so this album is the PERFECT size for my next project. Gorgeous! I love the texture, the shapes, the variety. Thanks for intriducing me to these albums. Brilliant job with the album! I love the mixture of textures, shapes and sizes. Yummy. Totally fun album!!! Will have to be on the lookout!!! I love that Pink Paislee paper. So cute. This album really makes for a fun and funky project, luv it! Love the idea of mixing it up. Great mini album! I am definitely intrigued and would love to give this kit a try. Ohh-hoo! That album looks awesome! I love the idea of mixing pages and textures to give a book even MORE interest! It looks like you got your mojo back... you rocked that album! oooooohh ooooh ooooh I think this is stinking cute... so would love this to play with hands on! Noel, love your album. All that texture and and different media to work with is awesome. Love the pictures of you and your camera. You always look beautiful. Thanks for the inspiration, I've been in a funk lately too. Now this is what I'm talking about! LOVE the mix--fun & funky. This Punky Love album is gorgeous!! I agree Noel--Canvas accessories would be yummy!! Love your adorable pics of you too! Thanks for sharing!! i normaly get bored quickly when making an album because the pages are the same. I like to use mixed media, so this album is just perfect!!! Love it! This album looks so cool!! Thanks Noel-not just for showing us a super cool new book but also telling us what could be improved about the product too! What a great album. 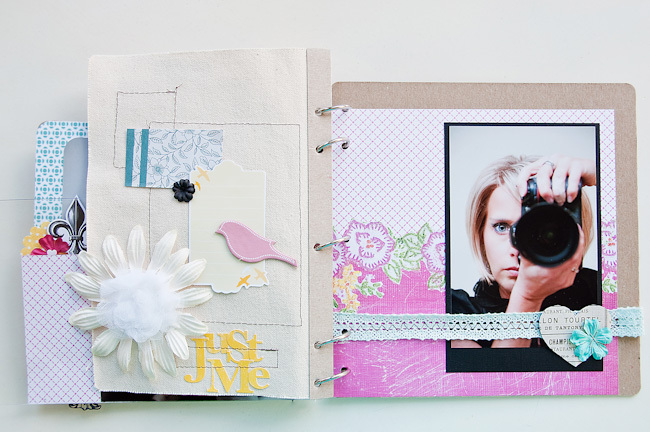 Love the different textured pages and the variety of ways you can embellish them. Love all the textures in that album, I think it would be fun to work with! Looks interesting, butmaybe just a little too funky for me. I like the texture, but not the different sized pages so much. My heart is racing with possibilities! The varied shapes and sizes of each page grouped together just pops with visual yumminess. LOVE LOVE LOVE what you did with that book! Love the layers and the different colors and textures are great! I loved these mixed media type of albums. It just gives so many possibilities for creating. I would love to get my hands on one! I absolutely love the mixed up albums! You did a wonderful project with yours! They look like so much creative fun! love the different textures!! looks like fun. I love this look, the different textures, color,and materials. One can be so much more creative by playing with all of these material. Wow! Awesome album! Love all of the different shapes, elements and textures! Yippee skippie! These look like super fun products! That is a neat idea! I've wanted to try something like this ever since I saw a mini made out of several other mini albums!! Oh WOW! 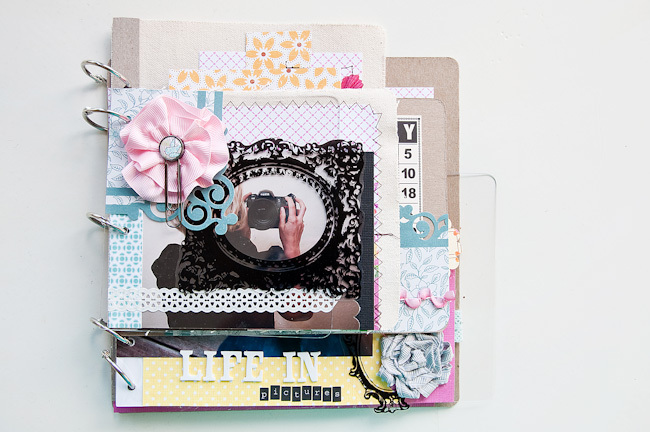 I just love this idea of mixed media albums. THANKS for posting this review. Looks like a very cool album. The fact that it is envronmentally friendly is a plus! I'm loving what I am seeing! Your work with the album is fantastic! I'm intrigued and may check out their DT call now! I'm a texture-type of scrapbooker so I love, love, love what you are doing with the uneven layers. 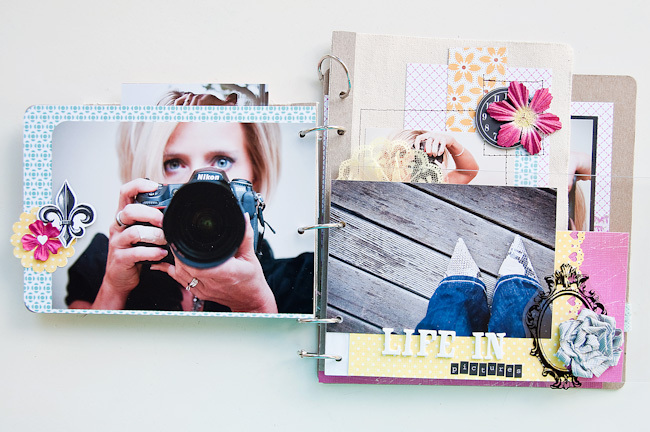 It's pretty whimsical and that is what everyone is trying to accomplish in their scrapbooking these days. I think you have started a totally new trend!!!! I fell in love with these when I got a note from Suzy on FB. I am dying to get my hands on one of them soon! I really can't wait. I am so glad your review sees them the way I do. I always lok here before buying. Thanks for being here! I'd love to try out this new album! Sure looks fun. What an awesome album...just adore it and I will be adding you to my faves!!! I would love to try this out!! !